Comparing Affordability and Benefits Between CHIP and Qualified Health Plans in 35 States: Which Coverage is Best for Kids? First Focus worked with Wakely Consulting Group on an actuarial value analysis to assess how CHIP stacks up with the Affordable Care Act’s qualified health plans (QHPs) in 35 states. 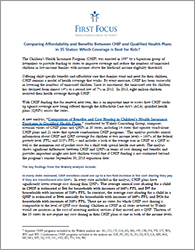 First Focus has summarized the findings from Wakely’s final report, which confirms that when comparing CHIP with QHPs, across every category, almost without exception, CHIP is more affordable for families with significantly lower cost-sharing and it provides more comprehensive benefits for children, especially children with special health care needs.